When we moved into this house at the end of October last year (yes, we've been here almost a full year so I'll officially have to stop calling it the 'new house') the one thing missing was a utility room. Okay, I know a utility room is a luxury and it's not always an option but the washer and dryer were both housed in the garage and my brother didn't want them in there. He loves his cars (two) and wanted to keep them in there without any other stuff cluttering 'his area of the house'. In fact he said he wanted the garage to be 'as God intended it to be'. Yeah. 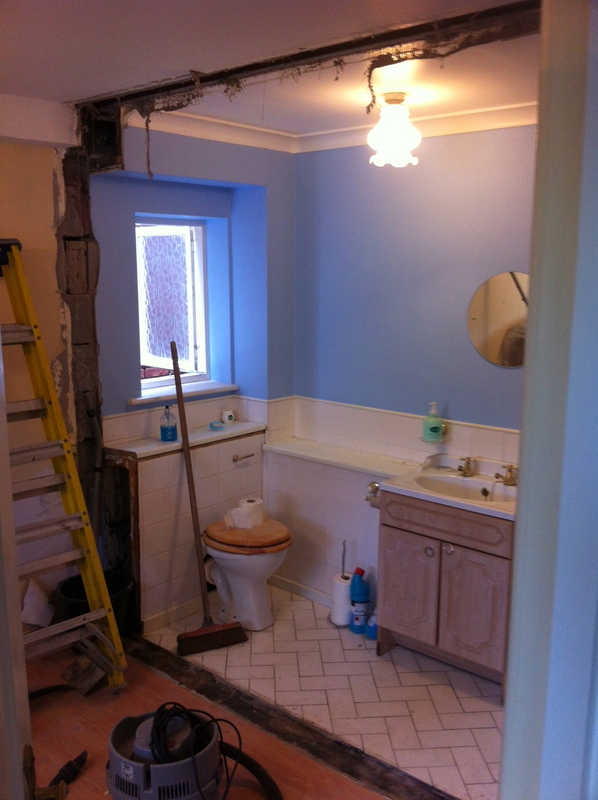 So, plans were drawn up for the downstairs look to be extended to incorporate a utility area. 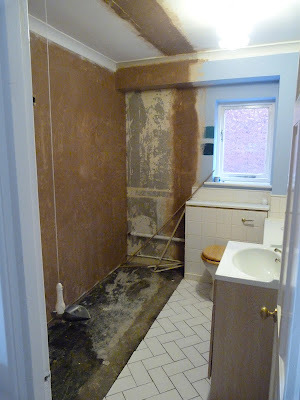 This is how the downstairs look looked before the work started. Perfectly okay and practical, although a teeny tiny bit boring. 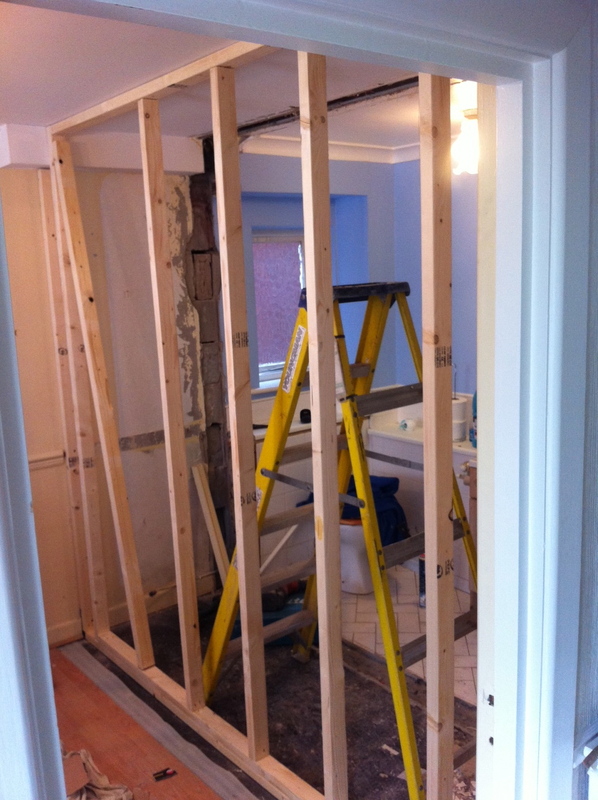 The plan was to remove the wall on the left and extend the room into the next door study, which was bigger than really necessary. Having said that, that means my original plan to have a squashy sofa in there - the study, not the loo - has now been shelved. Not enough room now y'see. Pah. Not a big job in itself. 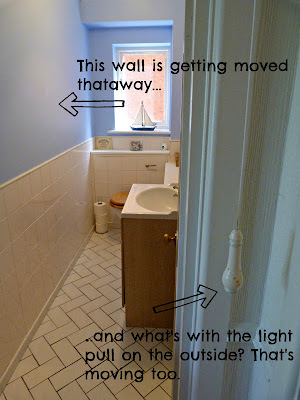 Move one wall, move the lightpull, sort out the electrics and flooring then redecorate. Easy, right? Well, first of all have a look what was on the other side of that wall. Yikes! Yes, this is the mess that was my study. Well, one end of it anyway. The other end has my desk and a pile of unpacked boxes from the move. But I can't unpack everything until the utility room is done because only then I can sort out my study. Next, the wall came down. Ooh look....an open plan study/downstairs loo. The new wall is up! Here's the new utility room shell. 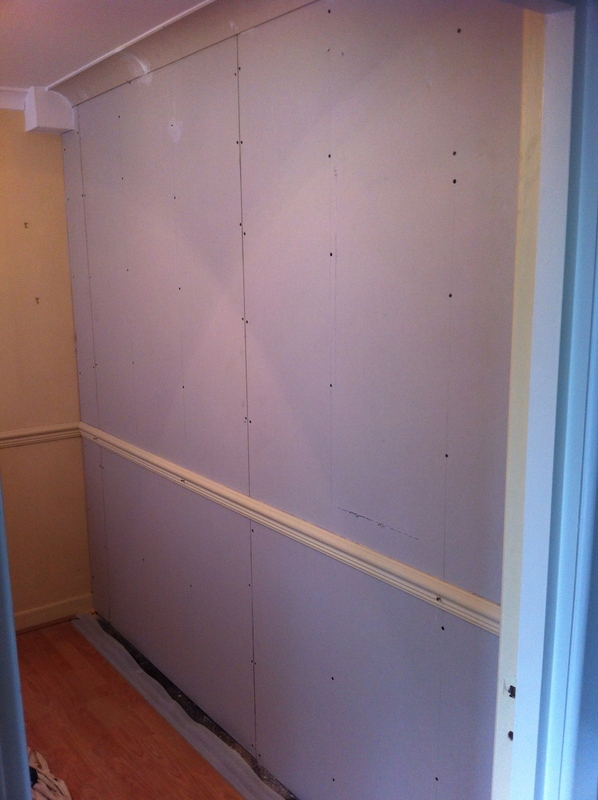 The wall has been moved and the new one plastered. 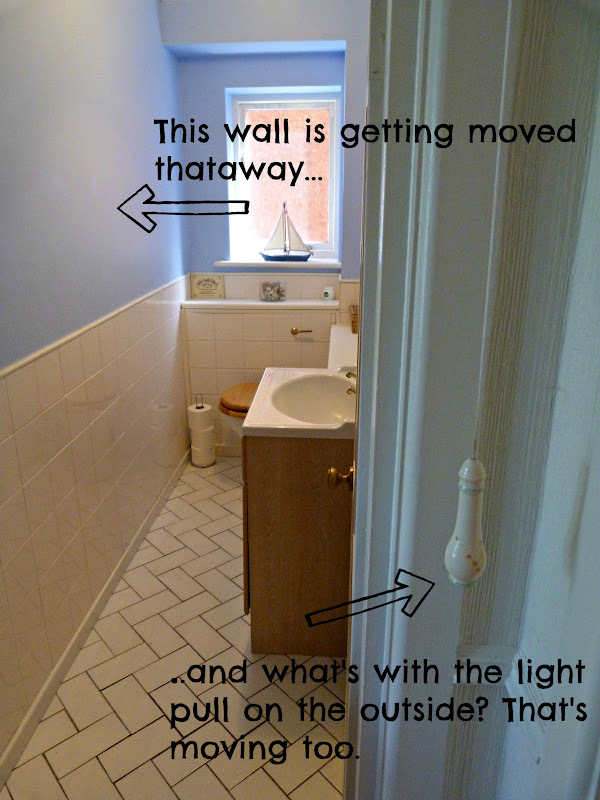 Oh, and the lightpull is now on the inside of the room. 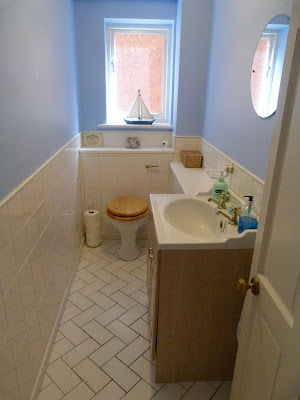 In an ideal world, I would have liked complete new floor tiles but the ones that were used were a) wall tiles, not really suitable for floors (too thin) and b) no longer available. Bummer. And to take the old ones up would mean removing the loo and sink unit and it started looking expensive, so we had to find another solution. The cheaper solution was to put down some good quality cushion floor - not ideal, but practical - but first the floor levels needed sorting out because the tiles were higher than the rest of the floor. I won't bore you with the details but it took two attempts by the builder to get the floor level and turned into a bigger problem than imagined. Unfortunately, because this happened I couldn't finish off painting the walls so the flooring went down before the room was painted, but hey ho, it's not the end of the world. Of course, the minute the new flooring was down my brother moved the machines in and then dumped everything that was non-car related in there too. 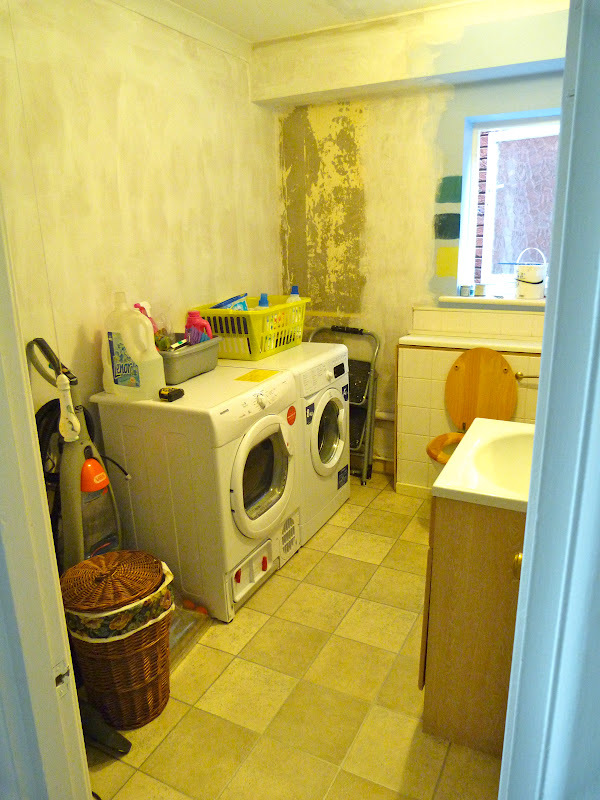 So his garage is now a shrine to cars, but the new utility room looks like this. went down. Welcome to Steptoe's Yard. But I have plans. And those plans include having the two machines stacked on top of each other and a new specially built storage cupboard. I'm also trawling the internet for decorating inspiration and pinning it all on my utility room pinterest board. Plus I've bought new cabinet handles, paint, material to (attempt) to make a blind and a storage tin for cleaning products. I can't wait to get it all finished. Strictly v X Factor: no contest! notsupermum. Simple theme. Powered by Blogger.